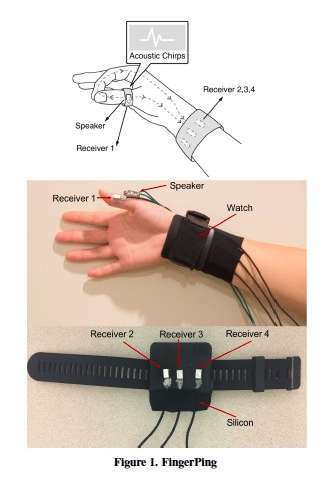 Using acoustic chirps emitted from a ring and received by a wristband, like a smartwatch, the system is able to recognize 22 different micro finger gestures that could be programmed to various commands—including a T9 keyboard interface, a set of numbers, or application commands like playing or stopping music. A video demonstration of the technology shows how, at a high rate of accuracy, the system can recognize hand poses using the 12 bones of the fingers and digits '1' through '10' in American Sign Language (ASL). "Some interaction is not socially appropriate," said Cheng Zhang, the Ph.D. student in the School of Interactive Computing who led the effort. "A wearable is always on you, so you should have the ability to interact through that wearable at any time in an appropriate and discreet fashion. When we're talking, I can still make some quick reply that doesn't interrupt our interaction." The system is also a preliminary step to being able to recognize ASL as a translator in the future, Zhang said. Other techniques utilize cameras to recognize sign language, but that can be obtrusive and is unlikely to be carried everywhere. "If my wearable can translate it for me, that's the long-term goal," Zhang said. The system is called FingerPing. Unlike other technology that requires the use of a glove or a more obtrusive wearable, this technique is limited to just a thumb ring and a watch. The ring produces acoustic chirps that travel through the hand and are picked up by receivers on the watch. There are specific patterns in which sound waves travel through structures, including the hand, that can be altered by the manner in which the hand is posed. Utilizing those poses, the wearer can achieve up to 22 pre-programmed commands. The gestures are small and non-invasive, as simple as tapping the tip of a finger or posing your hand in classic "1," "2," and "3" gestures. "The receiver recognizes these tiny differences," Zhang said. "The injected sound from the thumb will travel at different paths inside the body with different hand postures. For instance, when your hand is open there is only one direct path from the thumb to the wrist. Any time you do a gesture where you close a loop, the sound will take a different path and that will form a unique signature." Zhang said that the research is a proof of concept for a technique that could be expanded and improved upon in the future. How soon before tech is able to recognize that we're gesturing at it with our hands and arms without accoutrements? It works in the marvel universe - why not here?